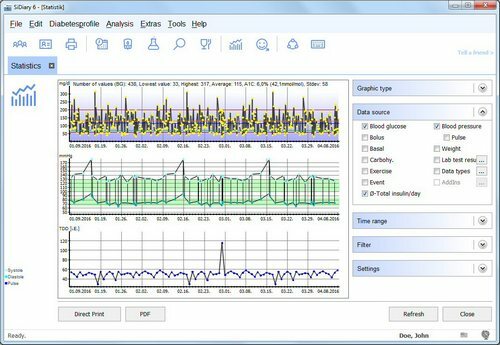 Our diabetes software SiDiary supports people with both main diabetes types 1 and 2 (but also others like LADA, gestational diabetes etc.) and offers several additional functionalities for pumpers. All used blood glucose drugs can be selected in your profile data, of course you can add new types of pills and insulins with a few clicks. 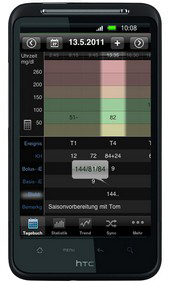 The software can manage your data in either mg/dl and also mmol/l and there's a blood glucose calculator for conversion of blood glucose levels from one unit into another or from whole blood into plasma and even into an A1c-value. In the logbook as a daily overview you can track all of your data on this single screen. You can enter your bg levels, carb intakes, your pills or insulin injections and also your blood pressure or ketones. If you want to explain some of the tracked values, you can enter any descriptions. The colorized style of the grid and the automatic mechanism for ording bg levels into the appropriate rows is giving you an immediate visual feedback for every tracked value. Of course the number of columns is not limited. 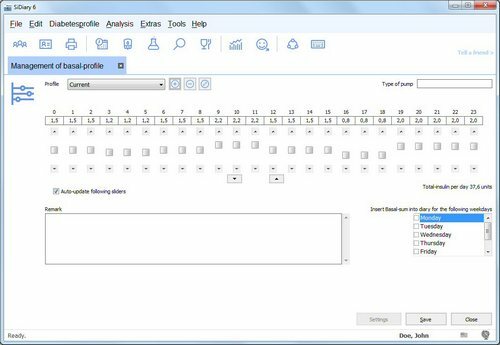 You can define the minimum of columns and how large they should appear in the logbook settings. The input of data is optimized in all versions for the corresponding hardware (Desktop computers or Smartphones): The windows version enables a fast and comprehensive capture of even mass data without the need to switch between mouse and keyboard. Besides the maintenance of your individual profile data (e.g. Blood glucose target range, used types of pills/insulins, carb ratios, rules for correction etc.) you can open the screens for adding new drugs. The pumpers screencan be opened by chosing the menu entry 'Diabetesprofil ->Managment of the basal-profile'. On the pumpers dialogue you can set-up your indivual basal profiles on a hourly base with the sliders and assign your profiles to the weekdays. The total sum of the appropriate basal profile will be send automatically to the correct weekday of your bg overview. Of course you can track several pump events also (i.e. Change of catheter, change of battery, change of ampoule etc.). The statistical graphs provide all necessary information. Assuming a good frequency of tracked bg levels, the calculated A1c will be close to your lab values taken from your doctor, what we have recognized from many users at the forum. 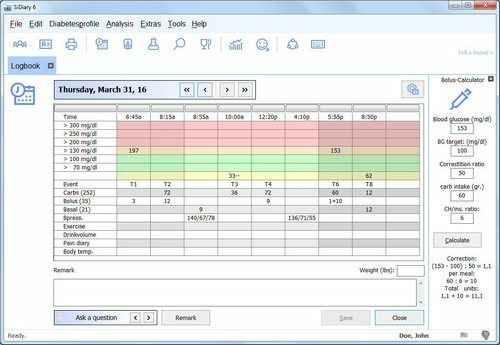 From the specialized graphical views you can take information like how many percent of your readings are in a low range, in your target range, in a high range or an x-high range. The dot graph will show any single reading from the analized time range as a single dot on a day time basis so that you can see if your readings are concentrated to the same hours (coming from a daily routine). The line graph will show the development of your bg level for the selected time range, which can be moved with slider buttons. 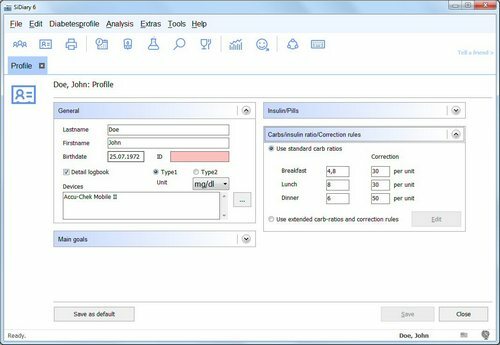 For all graphical views you can use several filters to get exactly the information you are searching for out of your data. On the menu ('Edit') or the button bar you will find also a form for maintaining lab result values, like A1C or kidney parameters. You can track those lab results with a timestamp and a target range of the laboratory so that you can compare them better with results from other labs and you can also specify further lab parameters that you want to track data for. Especially the export interface for MsExcel opens an unlimited range for data analysis and challenging, well looking graphs! The interaction of the Windows desktop application (for all Windows operating systems >XP) with the mobile devices allows data tracking on each device parallely: I.e. you can enter your readings from the morning into your Smartphone from lunch into your desktop computer at work, levels from the rest of the day into your Smartphone and the evening readings into your desktop computer at home. Every time you are synchronizing your mobile devices to 'SiDiary Online' and do the same with SiDiary on your PC all data will be synchronized. The merged data will be also written back to the Smartphone. All of the described statistics and trend functionalities are available on your mobile devices also. So you can even get your feedback on the way...and i.e. get a bolus suggestion based on your individual carb ratios and corrections rules. 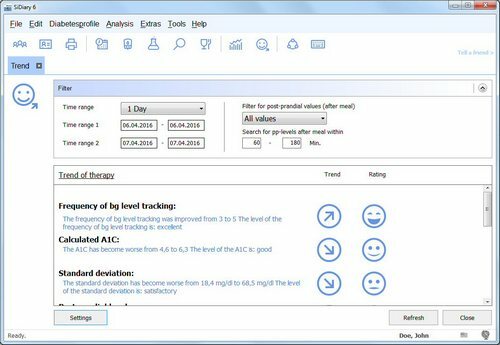 SiDiary's trend analysis: The trend analysis shall give you an immediate feedback for your current diabetes condition. With a simple smiley based symbolism and with arrows for displaying a trend you can see directly all important things. All of the results from the trend shall give you an idea of what possibly went wrong and these information have to be discussed with your healthcare professional: Never change anything of your therapy without having discussed the changes with your doctor! The above screenshots are showing a fictitious result of the trend analysis. Today the following categories are analyzed: Frequency of your readings, the calculated A1c, the standard deviation and the post-prandial levels (the last category means a blood glucose level from 60-110 minutes after carb intakes). The symbolism can tell you with the arrows if a category has become better or worse and the smileys are telling if the result is rated as very good, good, satisfactory or poor). In the settings you can select from 3 predefined profiles to set-up the limits for the categories or you can specify every single limit with an individual value. If your diabetes was less controlled or even uncontrolled for some time, you should start with the limits from profile C. At least you have recognized that something should be improved: You're interested in a feasible solution for improving your condition. Therefore the 3 profiles aren't a rating in any way! Don't let yourself become demotivated from unreachable targets! You will see very fast that your readings will become better from the only fact that you are tracking them - this has been proven with many studies. Later on you can use the tracked data to discuss it with your doctor and to see what could be improved in the future! If you are just getting smiling faces for some time you can decide if you want to switch into another profile with tougher limits! What can I get out of the trend parameters and which target levels would be best for me? The meaning of each category can be explaned very simple: Of course the frequency of the monitored blood glucose levels must be on a good level so that all further analysis does make sense! If you have just less readings with longer breaks between them you have no information about the time without readings...and also SiDiary cannot know how your blood glucose has changed in this 'uncovered' time. So the precision of the other categories will decrease according to the number of your readings! The A1c lab result parameter is taken as a very common indicator for your whole therapy and condition. It is telling you how your blood glucose levels have done in the last appr. 3 months. It's like a result from a permanent glucose watch. SiDiary can calculate an A1c from the tracked levels. Since the readings are just small pieces of the evolution of your bg levels the calculated value can have inaccuracies. The standard deviation is a pure math indicator to show you in which range the levels have been swayed through the average blood glucose level. Even the bg level of a non-diabetic is not constantly on his average. According to carb intake it will rise and from exercises it will go below of the average but of course they have a pretty small range for their levels. But you can follow this model and try to make your own range as small as possible. The analysis of the post-prandial level will check the peaks after a fasting level with carb intake. These peaks should be avoided strictly because the very short and high peaks of bg levels will hurt your vasculars, especially the vasculars in eyes and kidney and they cannot be seen in the A1c lab result! But of course we can tell you, which would be better in general: The A1c is better with lower numbers than with higher and this is also appropriate for the standard deviation and the postprandial levels. But this does not mean to force yourself to get these results squeezed to lowest levels, i.e. to get a an A1c of 5 just by increasing the standard deviation. Usually we would say that a diabetes with an A1c of 6.4 and a standard deviation of 30 is much better treated than another one with an A1c of 5.9 and a standard deviation of 70! You and your doctor are the best people for a decision about the targets for your individual situation!